The Financial Times expects an extension of the company's October round of funding. Emaar Entertainment opened a suitable-for-all-ages VR amusement park in the world-renowned Dubai Mall on February 28. Nine independent projects created with Microsoft HoloLens and Windows Mixed Reality. Techcrunch finds Samsung’s new AR avatars a, ‘Combination of compelling and creepy’. Venturebeat on the company that wants, ‘To bring AR to other verticals’. 7) Introducing The Azanaband. The World’s First Sensory Gaming Device. New Channel 4 drama, Kiss Me First, takes a Black Mirror style look at VR and immersive tech. Upload VR spots Mi Hiepa Sports, a soccer training and rehabilitation app from the UK. 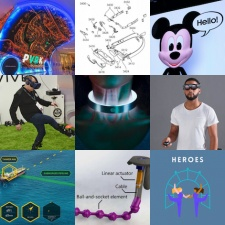 The US Patent and Trademark Office recently published a treasure trove of Magic Leap patent applications that appear to provide more details about the Magic Leap One: Creator Edition.